The new study, which will appear June 20 in Nature, was led by Fabrizio Nicastro of the Italian Istituto Nazionale di Astrofisica (INAF)--Osservatorio Astronomico di Roma and the Harvard-Smithsonian Center for Astrophysics. The Himalayan Range includes some of the youngest and most spectacular mountains on Earth, but the rugged landscape that lends it the striking beauty for which it is known can also keep scientists from fully understanding how these mountains formed. "We know more about the rocks on parts of Mars than we do about some of the areas in the Himalaya," said Dr. Alka Tripathy-Lang. This is a temple in the Nubra Valley of Ladakh, India, which is in the study area. The picture illustrates the enormous size and scale of the mountains in this part of the Himalayas. Top: Map made using ASTER satellite data imagery. Bottom: one "stretch" - or one color combination - of the ASTER data that was used to make the map. "We found carbonised malt in an area with low-temperature ovens located in a separate part of the settlement. The findings are from the 400-600s, making them one of the earliest evidence of beer brewing in Sweden", says Mikael Larsson, who specialises in archaeobotany, the archaeology of human-plant interactions. Carbonated turkeys from 400-600 BC found in Uppåkra interpreted as malt. "We often find cereal grains on archaeological sites, but very rarely from contexts that testify as to how they were processed. These germinated grains found around a low-temperature oven indicate that they were used to become malt for brewing beer", says Mikael Larsson. "Because the investigated oven and carbonised grain was situated in an area on the site with several similar ovens, but absent of remains to indicate a living quarter, it is likely that large-scale production of malt was allocated to a specific area on the settlement, intended for feasting and/or trading", explains Mikael Larsson. "From other archaeological sites in the Nordic region, traces of the bog-myrtle plant have been found, which indicates beer brewing. Back then, bog-myrtle was used to preserve and flavour beer. It wasn't until later during the Middle Ages that hops took over as beer flavouring", Mikael Larsson concludes. Two-litre soil samples are taken from various archaeological contexts - in houses, in pits, around hearths and ovens. The plant material found is usually preserved in a carbonised state. The soil is mixed with water and the carbon rises to the surface and is sieved through a fine mesh. The particles extracted are dried and studied under a microscope. The main focus of the team's research centered on properly dating the Anzick site which is named after the family who own the land. 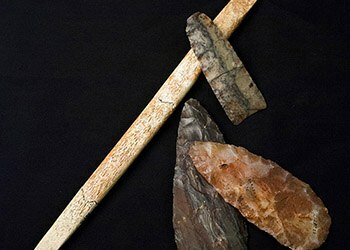 The site was discovered in 1968 by construction workers, who found the human remains and stone tools which include Clovis spear points and antler tools. It is the only known Clovis burial site and is associated with Clovis stone and antler artifacts. "This is important because we have resolved the dating issues at the site. Some researchers had argued that the human remains were not Clovis and were younger than the Clovis artifacts, based on the earlier radiocarbon dates. We have shown that they are the same age and confirmed that the Anzick site represents a Clovis burial." The findings are timely, as scientists are delving into the potential of genome editing with the DNA-cutting enzyme CRISPR-Cas9 to treat diseases or to advance scientific knowledge about humans, plants, animals and other organisms, said Irene Chiolo, Gabilan Assistant Professor of biological sciences at the USC Dornsife College of Letters, Arts and Sciences. 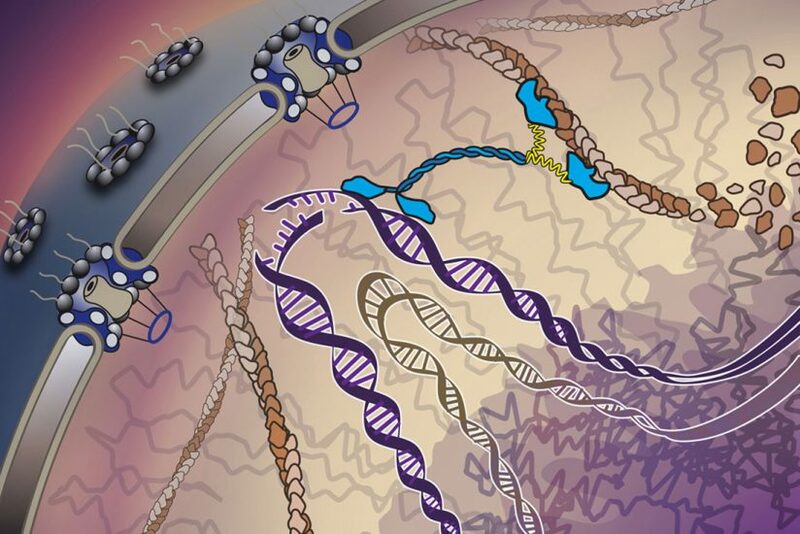 USC researchers studied the mechanism responsible for repairing DNA. Genome editing has arrived before scientists have thoroughly studied the significance and impact of DNA damage and repair on aging and diseases such as cancer. Chiolo’s work has offered more details about those processes. Using fluorescent markers, Chiolo and her team of USC Dornsife researchers tracked what happened when DNA was damaged in fruit fly cells and mouse cells. They saw how the cell launches an emergency response to repair broken DNA strands from heterochromatin, a type of tightly packed DNA. The study was published Wednesday in Nature. Repeated DNA sequences have had the bad nickname “junk DNA” for about 20 years. Scientists decoding the genome called it junk because they were initially focused on understanding the functions of individual genes. Based on a prior study, researchers knew that there was an “emergency room” — the nuclear pore where the cell fixes its broken DNA strands. Now, they have discovered how the damaged DNA travels there, Chiolo said. “I’m excited to see how the molecular mechanisms we uncovered work in humans, as well as in plants that have much larger heterochromatin,” said Christopher Caridi, a co-lead author for the study and a postdoctoral researcher in Chiolo’s lab at USC Dornsife. It will be fascinating, he said, to see how such a complex repair mechanism functions and evolves over time and what aspects of the mechanisms may be adapted for other functions. Citation: Nuclear F-actin and myosins drive relocalization of heterochromatic breaks. 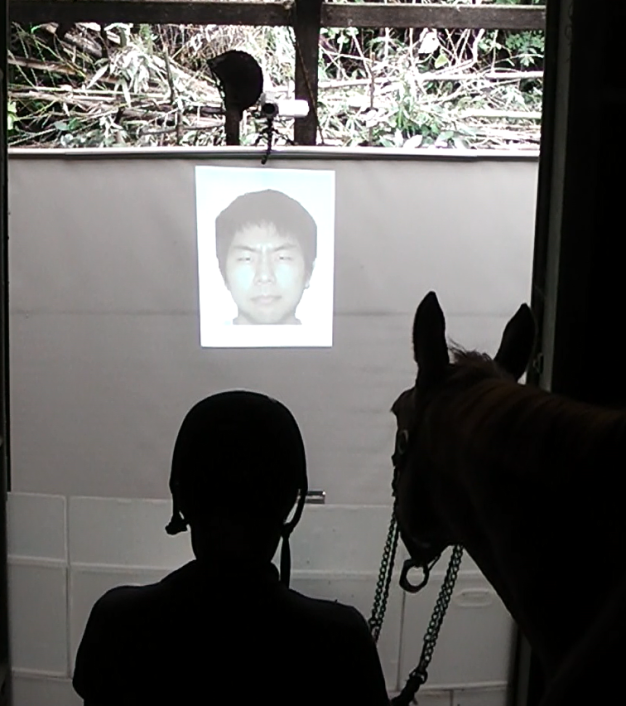 In the present study to be published in Scientific Reports, Associate Professor Ayaka Takimoto of Hokkaido University, graduate student Kosuke Nakamura of The University of Tokyo, and former Professor Toshikazu Hasegawa of The University of Tokyo, used the expectancy violation method to investigate whether horses cross-modally perceive human emotion by integrating facial expression and voice tone. They also tested whether the familiarity between the horse and the person affected the horse’s perception. The expectancy violation method has been used to study infant cognitive development. Horses were shown a picture of a happy facial expression or an angry facial expression on a screen, and they then heard a pre-recorded human voice ­– praising or scolding – from a speaker behind the screen. Horses received both the congruent condition, in which the emotional values of facial expression and voice tone were matched, and the incongruent condition, in which they were not. Horses are shown an angry or happy facial expression on the screen followed by a praising or scolding tone of voice during the test. 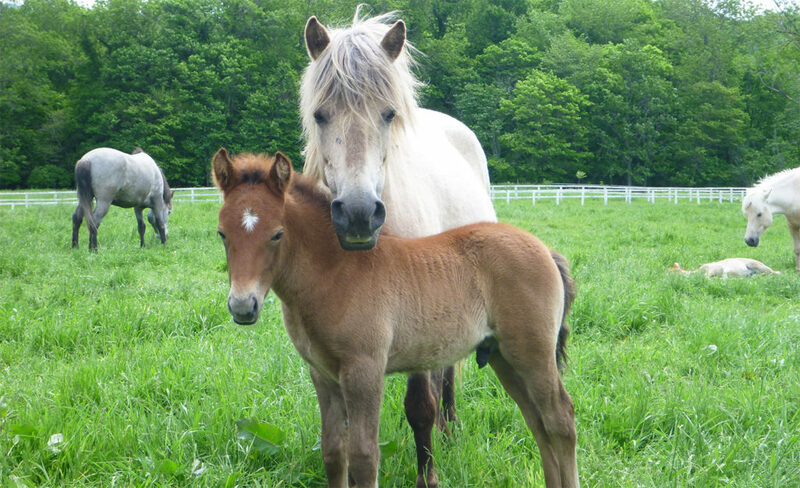 Horses responded differently in a congruent and incongruent condition. Photo taken by Kosuke Nakamura. “Our study could contribute to the understanding of how humans and companion animals send and receive emotional signals to deepen our relationships, which could help establish a better relationship that emphasizes the well-being of animals,” says Ayaka Takimoto of Hokkaido University. 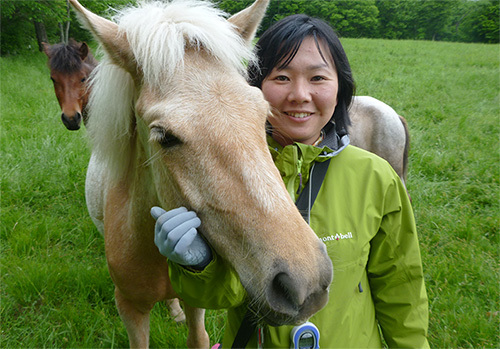 Associate Professor Ayaka Takimoto of Hokkaido University. Putting Sensors on Gummy Bears: Why Eat High Tech Candy? Researchers from TUM and Forschungszentrum Jülich have successfully teamed up to perform inkjet printing onto a gummy bear. This might initially sound like scientists at play - but it may in fact point the way forward to major changes in medical diagnostics. For one thing, it was not an image or logo that Prof. Bernhard Wolfrum's team deposited on the chewy candy, but rather a microelectrode array. These components, comprised of a large number of electrodes, can detect voltage changes resulting from activity in neurons or muscle cells, for example. Researchers from the Technical University of Munich (TUM) have succeeded in printing microelectrode arrays directly onto several soft substrates. Soft materials are better suited for devices that directly measure electrical signals from organs like the brain or heart. The researchers tested the process on various substrates, including PDMS (polydimethylsiloxane) - a soft form of silicon - agarose - a substance commonly used in biology experiments - and finally various forms of gelatin, including a gummy bear that was first melted and then allowed to harden. Each of these materials has properties suitable for certain applications. For example, gelatin-coated implants can reduce unwanted reactions in living tissue. "The difficulty is in fine-tuning all of the components - both the technical set-up of the printer and the composition of the ink," says Nouran Adly, the first author of the study. "In the case of PDMS, for example, we had to use a pre-treatment we developed just to get the ink to adhere to the surface." Prof. Wolfrum's lab is part of the Munich School of BioEngineering (MSB). This interdisciplinary TUM research center is Europe's most multi-disciplinary university institution focused on the interface between medicine, engineering and natural sciences. Citation: N. Adly, S. Weidlich, S. Seyock, F. Brings, A.Yakushenko, A. Offenhäusser, B. Wolfrum. "Printed Microelectrode Arrays on Soft Materials: From PDMS to Hydrogels." Npj Flexible Electronics 2:1 (2018). DOI:10.1038/s41528-018-0027-z. Eating foods high in salt is known to contribute to high blood pressure, but does that linear relationship extend to increased risk of cardiovascular disease and death? Recent cohort studies have contested that relationship, but a new study published in the International Journal of Epidemiology by investigators from Brigham and Women's Hospital and their colleagues using multiple measurements confirms it. The study suggests that an inaccurate way of estimating sodium intake may help account for the paradoxical findings of others. "Sodium is notoriously hard to measure," said Nancy Cook, ScD, a biostatistician in the Department of Medicine at BWH. "Sodium is hidden - you often don't know how much of it you're eating, which makes it hard to estimate how much a person has consumed from a dietary questionnaire. Sodium excretions are the best measure, but there are many ways of collecting those. In our work, we used multiple measures to get a more accurate picture." Sodium intake can be measured using a spot test to determine how much salt has been excreted in a person's urine sample. However, sodium levels in urine can fluctuate throughout the day so an accurate measure of a person's sodium intake on a given day requires a full 24-hour sample. In addition, sodium consumption may change from day to day, meaning that the best way to get a full picture of sodium intake is to take samples on multiple days. Funding for this work was provided by the National Heart, Lung and Blood Institute (NHLBI) grant numbers HL37849, HL37852, HL37853, HL37854, HL37872, HL37884, HL37899, HL37904, HL37906, HL37907, HL37924, HL57915; and 14GRNT18440013 from the American Heart Association. "We've made a sensor that goes over the fingertips of a prosthetic hand and acts like your own skin would," says Luke Osborn, a graduate student in biomedical engineering. "It's inspired by what is happening in human biology, with receptors for both touch and pain. "This is interesting and new," Osborn adds, "because now we can have a prosthetic hand that is already on the market and fit it with an e-dermis that can tell the wearer whether he or she is picking up something that is round or whether it has sharp points." The work, published online in the journal Science Robotics, shows it's possible to restore a range of natural, touch-based feelings to amputees who use prosthetic limbs. The ability to detect pain could be useful, for instance, not only in prosthetic hands but also in lower limb prostheses, alerting the user to potential damage to the device. "Pain is, of course, unpleasant, but it's also an essential, protective sense of touch that is lacking in the prostheses that are currently available to amputees," he says. "Advances in prosthesis designs and control mechanisms can aid an amputee's ability to regain lost function, but they often lack meaningful, tactile feedback or perception." That's where the e-dermis comes in, conveying information to the amputee by stimulating peripheral nerves in the arm, making the so-called phantom limb come to life. Inspired by human biology, the e-dermis enables its user to sense a continuous spectrum of tactile perceptions, from light touch to noxious or painful stimulus. The e-dermis does this by electrically stimulating the amputee's nerves in a non-invasive way, through the skin, says the paper's senior author, Nitish Thakor, a professor of biomedical engineering and director of the Biomedical Instrumentation and Neuroengineering Laboratory at Johns Hopkins. "For the first time, a prosthesis can provide a range of perceptions from fine touch to noxious to an amputee, making it more like a human hand," says Thakor, co-founder of Infinite Biomedical Technologies, the Baltimore-based company that provided the prosthetic hardware used in the study. The team created a "neuromorphic model" mimicking the touch and pain receptors of the human nervous system, allowing the e-dermis to electronically encode sensations just as the receptors in the skin would. Tracking brain activity via electroencephalography, or EEG, the team determined that the test subject was able to perceive these sensations in his phantom hand. Johns Hopkins is a pioneer in the field of upper limb dexterous prosthesis. More than a decade ago, the university's Applied Physics Laboratory led the development of the advanced Modular Prosthetic Limb, which an amputee patient controls with the muscles and nerves that once controlled his or her real arm or hand. Citation: Prosthesis with neuromorphic multilayered e-dermis perceives touch and pain. Antarctica, as seen using Google Earth, and a cut to show the interior of the earth, where the mantle (red and dark red) and the core (yellow) are visible. The Amundsen Sea Embayment is indicated by the red rectangle. On the right, a photo reveals one of the GPS sites in the study. The Department of Geosciences is part of the Warner College of Natural Resources. An international team of astronomers using the NASA/ESA Hubble Space Telescope and the European Southern Observatory’s Very Large Telescope has made the most precise test of general relativity yet outside our Milky Way. The nearby galaxy ESO 325-G004 acts as a strong gravitational lens, distorting light from a distant galaxy behind it to create an Einstein ring around its centre. By comparing the mass of ESO 325-G004 with the curvature of space around it, the astronomers found that gravity on these astronomical length-scales behaves as predicted by general relativity. This rules out some alternative theories of gravity. Einstein’s general theory of relativity predicts that objects deform spacetime, causing any light that passes by to be deflected. This effect is only noticeable for very massive objects. One result of this deformation of spacetime is that light from distant sources is deflected around a massive intervening object, such as a galaxy. ESO 325-G004 is the large haze of light in the centre of the screen which is deforming light from the background galaxies. 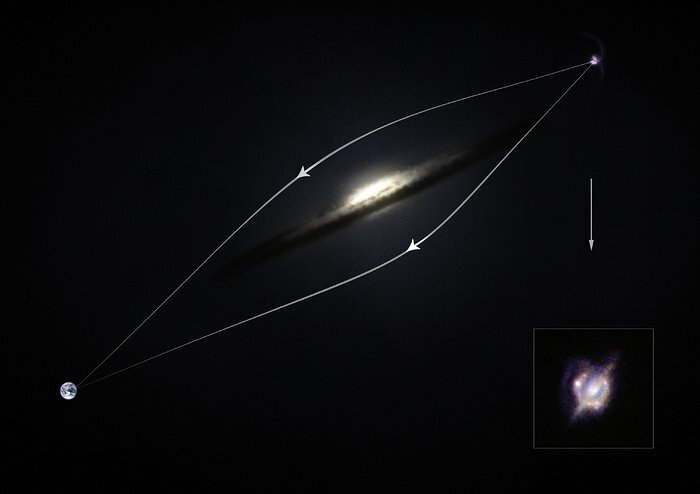 This diagram shows how the effect of gravitational lensing around a normal galaxy focuses the light coming from a very distant star-forming galaxy merger to created a distorted, but brighter view. The NASA/ESA Hubble Space Telescope and many other telescopes on the ground and in space have enlisted the help of a galaxy-sized magnifying glass to reveal otherwise invisible detail and obtain the best view yet of a collision that took place between two galaxies when the Universe was only half its current age. The image showing these combined observations can be seen in the inset. These new studies of the galaxy H-ATLAS J142935.3-002836 have shown that this complex and distant object looks surprisingly like the well-known local galaxy collision, the Antennae Galaxies. 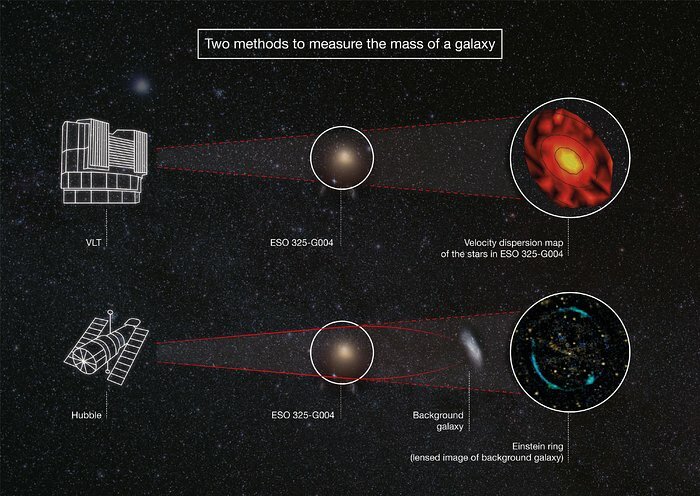 This infographic compares the two methods used to measure the mass of the galaxy ESO 325-G004. The first method used ESO’s Very Large Telescope to measure the velocities of stars in ESO 325-G004. 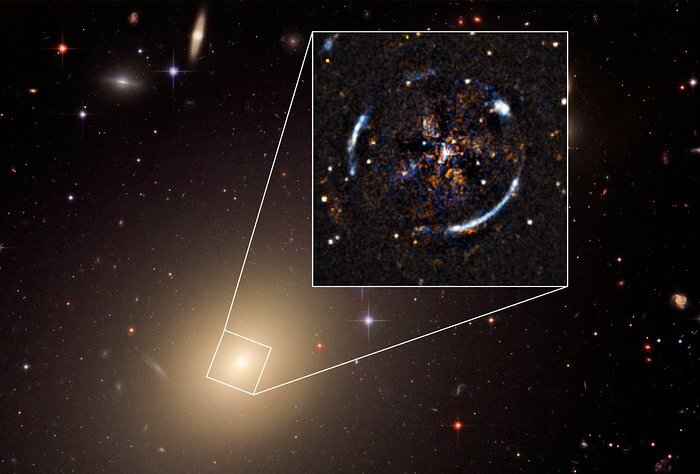 The second method used the NASA/ESA Hubble Space Telescope to observe an Einstein ring caused by light from a background galaxy being bent and distorted by ESO 325-G004. By comparing these two methods of measuring the strength of the gravity of ESO 325-G004, it was determined that Einstein’s general theory of relativity works on extragalactic scales — something that had not been previously tested. This video pans across NASA/ESA Hubble Space Telescope observations of the elliptical galaxy ESO 325-G004 that lies about 450 million light-years away. 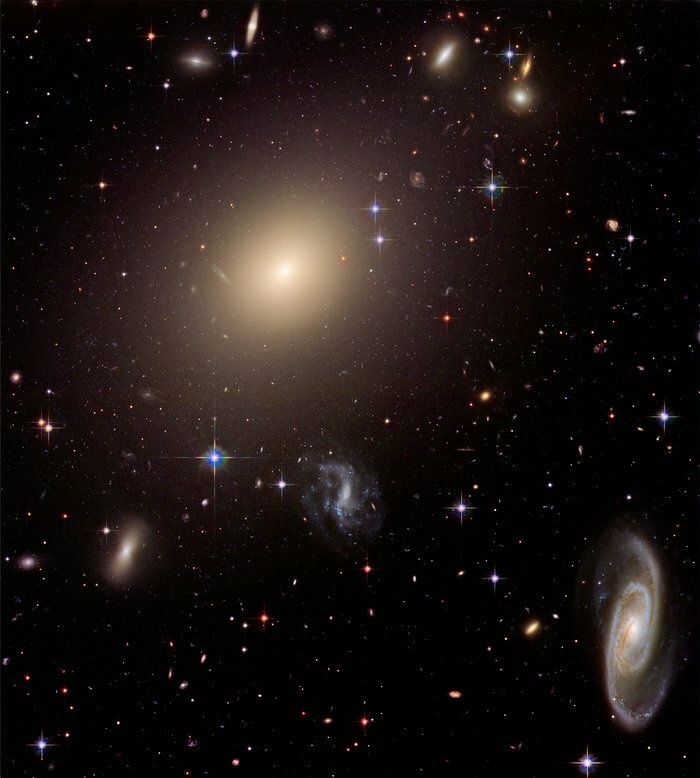 The galaxy is part of a diverse collection of galaxies in the cluster Abell S0740. Two new Ediacaran-era fossils discovered by UCR researchers: Obamus coronatus (left) and Attenborites janeae. An isolated hill in the Medusae Fossae Formation. The effect of wind erosion on this hill is evident by its streamlined shape. A global geographic map of Mars, with the location of the Medusae Fossae Formation circled in red. The new findings suggest the Martian interior is more complex than scientists originally thought, according to Ojha. Scientists know Mars has some water and carbon dioxide in its crust that allow explosive volcanic eruptions to happen on its surface, but the planet's interior would have needed massive amounts of volatile gases - substances that become gas at low temperatures - to create a deposit of this size, he said. This graphic shows the relative size of the Medusae Fossae Formation compared to Fish Canyon Tuff, the largest explosive volcanic deposit on Earth. Neuroscientists at Western University’s Brain and Mind Institute, have confirmed and detailed a rare case of a blind woman able to see objects – but only if in motion. A team led by neuropsychologist Jody Culham has conducted the most extensive analysis and brain mapping to date of a blind patient, to help understand the remarkable vision of a 48-year-old Scottish woman, Milena Canning. Neuropsychologist Jody Culham of the Brain and Mind Institute at Western University in London, Canada, led research into the brain of a blind woman able to se the motion of objects but not the objects themselves. Canning lost her sight 18 years ago after a respiratory infection and series of strokes. Months after emerging blind from an eight-week coma, she was surprised to see the glint of a sparkly gift bag, like a flash of green lightning. Then she began to perceive, sporadically, other moving things: her daughter’s ponytail bobbing when she walked, but not her daughter’s face; rain dripping down a window, but nothing beyond the glass; and water swirling down a drain, but not a tub already full with water. Glaswegian ophthalmologist Gordon Dutton referred Canning to the Brain and Mind Institute in London, Canada, where tests by Culham’s team included functional Magnetic Resonance Imaging (fMRI) to examine the real-time structure and workings of her brain. They determined Canning has a rare phenomenon called Riddoch syndrome – in which a blind person can consciously see an object if moving but not if stationary. “She is missing a piece of brain tissue about the size of an apple at the back of her brain – almost her entire occipital lobes, which process vision,” says Culham, a professor in the Department of Psychology and Graduate Program in Neuroscience. In essence, Canning’s brain is taking unexpected, unconventional detours around damaged pathways. During the study, Canning was able to recognize the motion, direction, size and speed of balls rolled towards her; and to command her hand to open, intercept and grab them at exactly the right time. She could navigate around chairs. Yet she inconsistently identified an object’s colour, and was able only half the time to detect whether someone’s hand in front of her showed thumb-up or thumb-down. The research shows the remarkable plasticity of the human brain in finding work-arounds after catastrophic injuries. And it suggests conventional definitions of ‘sight’ and ‘blindness’ are fuzzier than previously believed. “Patients like Milena give us a sense of what is possible and, even more importantly, they give us a sense of what visual and cognitive functions go together,” Culham says. For Canning, the research at BMI helps explain more about what she perceives and how her brain is continuing to change.She is able to navigate around chairs, can see a bright-shirted soccer goalie and can see steam rising from her morning cup of coffee, for example. “I can’t see like normal people see or like I used to see. The things I’m seeing are really strange. There is something happening and my brain is trying to rewire itself or trying different pathways,” Canning says. The research is newly publishedin the journal Neuropsychologia. Citation: Psychophysical and neuroimaging responses to moving stimuli in a patient with the Riddoch phenomenon due to bilateral visual cortex lesions. The true source of turquoise used by ancient Mesoamerican people has been found and it is not what scientists thought. New research published June 13th in the journal Science Advances overturns more than a century of thought about the source of turquoise used by ancient civilizations in Mesoamerica, the vast region that extends from Central Mexico to Central America. For more than 150 years, scholars have argued that the Aztec and Mixtec civilizations, which revered the precious, blue-green mineral, acquired it through import from the American Southwest. However, extensive geochemical analyses reveal that the true geologic source of Aztec and Mixtec turquoise lies within Mesoamerica. This is a close up view of Mixteca-style mask decorated with turquoise mosaic from the collections of the Smithsonian Institution-National Museum of the American Indian. NMAI Catalog #10/8712. Specifically, Thibodeau and her research team carried out analyses of lead and strontium isotopes on fragments of turquoise-encrusted mosaics, which are one of the most iconic forms of ancient Mesoamerican art. Their samples include dozens of turquoise mosaic tiles excavated from offerings within the Templo Mayor, the ceremonial and ritual center of the Aztec empire, and which is located in present-day Mexico City. This is a close up view of Mixteca-style shield decorated with turquoise mosaic from the collections of the Smithsonian Institution-National Museum of the American Indian. NMAI Catalog #10/8708. They also analyzed five tiles associated with Mixteca-style objects held by the Smithsonian's National Museum of the American Indian. The analyses revealed that turquoise artifacts had isotopic signatures consistent with geology of Mesoamerica, not the Southwestern United States. This is a reconstructed turquoise mosaic disk from Offering 99 in the Templo Mayor. Photo by Oliver Santana. Reproduced with permission from Editorial Raices. Citation: Was Aztec and Mixtec turquoise mined in the American Southwest? The retreat of the West Antarctic ice masses after the last Ice Age was reversed surprisingly about 10,000 years ago, scientists found. This is in stark contrast to previous assumptions. In fact, it was the shrinking itself that stopped the shrinking: relieved from the weight of the ice, the Earth crust lifted and triggered the re-advance of the ice sheet. However, this mechanism is much too slow to prevent dangerous sea-level rise caused by West Antarctica’s ice-loss in the present and near future. Only rapid greenhouse-gas emission reductions can. West Antarctica: The maximum ice sheet extension is shown in green, the minimum extent 10,000 years ago in red, and the modern grounding line after the rebound in orange. The team was able to find out why the rebound happened in West Antarctica. It is well-known that the Earth crust can get depressed by the weight of kilometer-thick ice on it – when the ice disappears, the ground lifts up. This is called isostatic rebound. However, this depends on the complicated characteristics of the Earth mantle in a given region – scientists for instance talk about viscosity. So far it was not known that the Earth crust in West Antarctica lifted in a way that made the shrinking ice re-advance. Previously, researchers assumed that after the last glacial maximum West Antarctica’s ice retreated continuously. Now it seems they have been generally right about the retreat, but have not fully grasped its dynamics. “When I observed the re-growth in our numerical computer simulations of Western Antarctica, I first thought this might be a flaw – it looked so different from what you find in the text books,” says Torsten Albrecht. 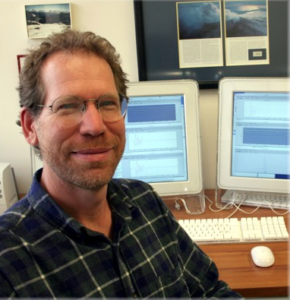 “So I started figuring out the involved interactions between the ice, ocean and Earth and their typical time scales.” In fact, the computer simulations turned out to help making sense out of observational data that other scientists found who had not relation to the work of the Potsdam modeling team – but were equally irritated at first about their respective findings. During a trip to Antarctica to study ancient ice flows, Jonathan Kingslake and colleagues from Columbia University’s Lamont-Doherty Earth Observatory, based in New York, towed a radar device across the ice. To their surprise, the radar spotted cracks in the ice where there shouldn’t be any. “It was just bizarre,” says Kingslake, who is one of the study’s three lead-authors. “We hadn’t seen these kinds of structure near the base of an ice sheet before.” Further analyses of the signals revealed that the ice on the rocky ground must have been stretching or squishing rapidly, whereas this was so far considered a slow-moving area. In yet another independent investigation, scientists looked into sediments recovered by drilling through many layers of ice to where it is grounded on rocks. The area was thought to be covered by grounded ice since the past Ice Age. But the team of Reed Scherer from Northern Illinois University, the third lead-author of the study now published, found organic material beneath the ice – the remains of tiny sea creatures long dead. This indicates that this area was connected to the ocean more recently than anybody thought. This is due to the rapid retreat and slow re-growth of the ice thousands of years ago. A number of factors influences the ice-sheet behavior under warming. In the studied region sea mountains turned out to be rather important for the ice dynamics. The peaks of these mountains underneath the floating ice shelves reach up from the bottom of the ocean. When the bottom rises they can become ice rises within the ice shelf. Since they’re made of solid rock, they increase the stability of the ice sheet. The scientists call this a buttressing effect. Conditions for ice re-growth might be less favorable in other areas. Citation: Extensive retreat and re-advance of the West Antarctic Ice Sheet during the Holocene.